Thanks to the 5 hour time difference, getting up at 5:30 am felt more like having a lie-in. As our eager taxi driver sped into the drop off zone, a guy was about to step onto the crossing just in front of us, but then thought better of it. Someone else did step out in front of the taxi‚Äôs path, and forced us to the side of the road. ‚ÄúLicense and Registration‚Äù were the welcoming words from the Boston Police Officer. Phil and I sat in the back, watching the meter tick away while the officer questioned our taxi driver for quite a while. The driver‚Äôs less than brilliant grasp of the English language did little to persuade the officer that he wasn‚Äôt an illegal. In the end, he was told to report to the taxi station officer as soon as he‚Äôd dropped us off. We made our way into the terminal, and checked in at the First Class desks. We then headed through security to the departures lounge, and into the Admirals Club. The Club can only be used by passengers travelling internationally in Business and First cabins, but our OneWorld Emerald status (from our BA Gold cards) meant this restriction didn‚Äôt apply to us. It‚Äôs an interesting perk, as it‚Äôs not one extended to AA‚Äôs top status (Executive Platinum) passengers. That said, the Admiral‚Äôs Clubs aren‚Äôt anything special ‚Äì you get a voucher for a single free drink from the bar, and anything more comes out of your own pocket. This is the exception to every other Business/First Class airline lounge I‚Äôve experienced. Today was even more exceptional though ‚Äì not only did we not get drinks vouchers, they also weren‚Äôt serving any alcohol until noon! It was already nearly 7:30am and our champagne reserves had hit a new low. After a quick coffee, I popped into a shop to pick up a book to read. The selection was limited, but I did manage to pick out ‚ÄúBusting Vega$‚Äù in preparation for my trip there in later in the year. We then made our way to the gate and waited for boarding. First Class passengers were boarded first, and we had our boarding passes scanned before walking down the jetty to the Boeing 757. 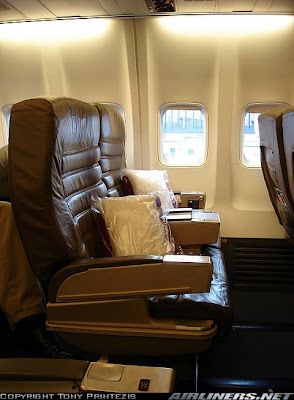 We took our seats at the back of the First cabin, 6E and 6F. While I‚Äôm normally a fan of the front rows, American Airlines have what‚Äôs known as a FEBO system (Front Even Back Odd) which governs who is served their meal first. As our flight number was an odd number, we‚Äôd picked the last row so that we‚Äôd have first choice. This was my first time on an American Airlines domestic flight in First Class. The seats were like reasonable sized leather arm chairs with a blanket and pillow, and were quite comfortable. However, the flight to San Francisco was more than six and half hours, which in most cases would be an international flight with beds rather than short-haul seats. The Purser on the aircraft came and introduced herself to all of the First Class passengers, handed out the meal menus, and took our orders for pre-flight drinks. They don‚Äôt serve champagne on the American flights, but they did have sparkling white wine, and we did our bit relieve them of their supplies. For breakfast we were had an omelette with roasted tomatoes, which was better than I‚Äôd first expected. Later on in the flight, the crew offer chocolate chip cookies and milk ‚Äì not a combination I‚Äôve ever encountered, but an American tradition I believe. I declined the milk, but definitely made the right choice in accepting the cookie. They bake them on board, rather than just heating up shop-bought ones, and it‚Äôs an excellent touch. The service on the flight from the crew was excellent. We were never without a drink, they were happy to engage in conversation, even if the idea of our flight pattern was a little unsettling to them! The in-flight entertainment was a film (In Pursuit of Happyness) which was played after a particularly uninteresting interview the Snapple lady (whoever that is). There were two annoying things about the film ‚Äì 1) There was a constant tone in the background of the audio track, and 2) Every 20 minutes or so the sound stopped working, and they had to fix it, rewind a bit, and then play it again until it next broke. Overall, this flight was a very pleasant introduction to the madness of what we were doing. Although we were in short haul seats for what was effectively a long haul flight, we‚Äôd had a comfortable ride. To top it off, our flight landed 30 minutes early, which gave us the hope of catching an earlier flight to Los Angeles. We went straight to the Admirals Club to see if we could get on the earlier Los Angeles flight which left in around 40 minutes. While the flight was full, the fact that 2 First Class passengers hadn‚Äôt checked in so close to the departure time suggested they weren‚Äôt coming. The agent on the desk wait listed us for First Class on the flight, and our status saw us straight to the top of the waiting list. Having waited at the gate, we noticed on the screen that two people that were waiting for upgrades received them‚Ä¶ meaning our two potential seats were filled. We went back to the lounge to question this, and the agent looked quite surprised. Then she realised that the two people that were upgraded had paid over $1000 each for their tickets, and said that was probably why. It didn‚Äôt bother us much as it meant more drinking time in the lounge, and to be honest, if people are going to pay more for an economy 1 hour flight than we paid for our 6 First Class flights, they need all the help they can get. Our flight turned out to be an hour late, but this wasn‚Äôt a problem since we had a 3 hour connection at LA for our flight onto Honolulu. We grabbed a few more Sam Adams while we waited. Eventually, boarding was called. Being such a short flight, we knew there would be no meal service, so we ignored the FEBO and chose front row seats 3A and 3B. This flight was on an MD-S80 ‚Äì a much smaller plane, but still with 2 seats on each side of the aisle. The seats were newer than the 757 seats of the previous flight, but they felt slightly less wide. The crew were friendly and efficient. We had some more drinks, but I was really going off the sparkling white wine by the end of the flight. The flight time passed quickly, and it wasn‚Äôt long before we were on the ground in L.A., and walking up the jetty into the terminal. L.A.‚Äôs airport is one of the very few to host an AA Flagship Lounge in addition to the normal Admiral‚Äôs Club. The Flagship Lounge is for AA First Class International passengers only (not Business), but our fortunately BA Gold status provided us with free passage. The lounge is quite like BA‚Äôs Business Class ‚ÄúTerraces‚Äù lounges, as you get free self service drinks (i.e. not a bar/voucher system like the Admiral‚Äôs Club) and it also provides a selection of sandwiches and other small snacks. As we waited for our 8:20pm (Pacific Time) flight, we were starting to feel somewhat on the tired side, given we‚Äôd been travelling now for around 17 hours. We were grateful when our flight was called for boarding, as it meant once we‚Äôd boarded we could crash out and hopefully grab a bit of kip in the air. 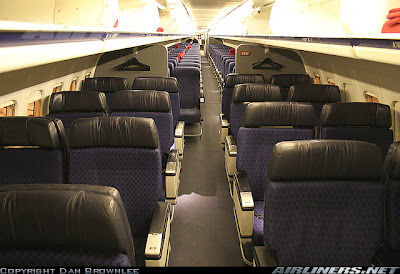 We were on a 757 again, with the large leather seats that we‚Äôd had on the first AA light. However, surprisingly for such a late flight, the pillows provided were pathetically small. We were again in 6E and 6F in order to get first choice on the food front. As other passengers boarded, we spotted celebrity number 2 of the trip ‚Äì Naveen Andrews who plays Sayid in LOST. Given the story of LOST, this wasn‚Äôt the most relaxing feeling! He wasn‚Äôt travelling with any of the other actors, but Phil reckoned the bloke he was travelling with looked like the girl who plays Kate. There‚Äôs no educating some people. There were no menus on this flight ‚Äì this was probably because it‚Äôs more of a leisure destination than a business route like Boston ‚Äì San Francisco. The food was chicken breast in tomato sauce with mashed potato. However, the food wasn‚Äôt really warmed through very well, and it was pretty tasteless. The whole First Class cabin crew were very friendly and chatty, even though they were somewhat baffled by the fact that we were only spending 2 nights and one full day in Hawaii. I managed to get an hour or so of sleep, which was pretty uncomfortable because of the pointless pillow. For a night flight I would avoid row 6 in future as it‚Äôs right by the toilets, and some people just can‚Äôt use them quietly. I only watched bits of the film (this time it was The Holiday) as I‚Äôd already seen it, and again it had that annoying tone in the background. This flight really dragged ‚Äì despite being slightly shorter than the first AA flight. However, by the end of it we‚Äôd done around 14 hours of flying, and that was taking its toll. We landed fairly knackered, and made our way to find a courtesy bus to take us to our rental car (which we‚Äôd booked while in Boston). The Avis desk were very efficient ‚Äì our Mustang convertible was ready and waiting, and we were handed the Garmin GPS unit that would lead us to our hotel. The rental cost including taxes was $200 for 2 days unlimited mileage. I was able to decline every acronym offered (CDW, PI, EW etc.) as my Platinum Amex card would cover all of that ‚Äì an excellent perk. As I started up the 4.6 litre engine, I was most pleased that it welcomed me with not so much a purr, but rather a growl. The drive home showed that it was great in a straight line with lovely acceleration, but I certainly wouldn‚Äôt trust it if I ever came to a corner. The suspension on these (and most American) cars felt a bit like driving on a water bed. 30 minutes later, we were being checked into our hotel by a guy who had more makeup on than Alice Cooper. I would have found this somewhat disturbing if I wasn‚Äôt ready to collapse. By the time we‚Äôd found our rooms, it was about 1am Honolulu Time ‚Äì we‚Äôd been travelling for more than 25 hours.